...what I would have given to had Delta Quadrant ships (Voyager especially) for this interview. That's me, running a demo of the game for Garrett Wang (who played Ensign Harry Kim) for an upcoming Geek & Sundry vlog. Yes, I'll post links when the video goes live. And it's live! BBG is still pending the approval of the video to be listed up at the top but I thought I'd also put it here as well. Well done! I see that Garrett is taking the Enterprise while you have...the Ferengi LE model? And Star Trek Deck Building Game: The Next Generation and Star Trek: Fleet Captains also. Putting on my geek hat here. But, could someone finally explain to me how Ensign Kim served seven years on the Voyager, as a senior officer due to casualties sustained, serving with distinction on a ship lost on the other side of the galaxy. And still, never receive a battlefield promotion from his captain? Because Janeway secretly hated him? A while ago I got to meet Michael Dorn at the annual Comic Expo here in Winnipeg and got his autograph (as seen below)and that same afternoon I went and played my Star Trek Tactics Klingon fleet at my FLGS. Not the same as playing with the actor but he was pretty busy. 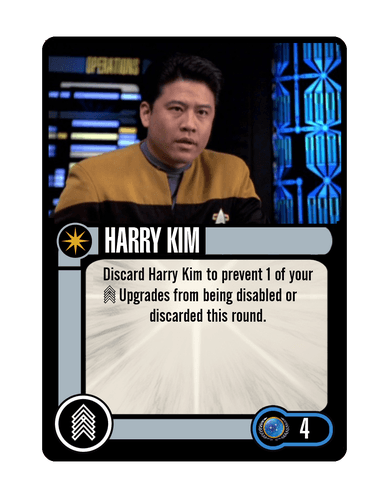 Does anyone think we'll see a Harry Kim crew card with Voyager? If not, I'd be up for making a custom one... any ideas on ability? I Play With Toy Soldiers. Didn't he actually die in an episode and his double continued on? Voyager is my least favorite of the series. I didn't like Voyager, especially Harry Kim. But Garrett Wang is one of the nicest, most accessible Trek actors around. If any of them will sit down and play Attack Wing with you, it'll be him. I cannot speak more highly of Garrett. he was charming, totally invested and very very generous. I wish I had more time - we only played a very stripped down version (a demo, if you will) because he only had a little time to spare with me. 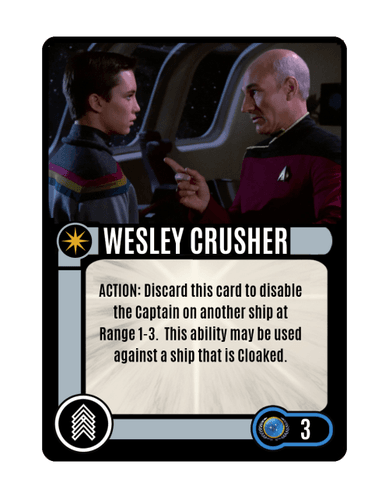 I suspect Attack Wing will show up on TableTop once a Wesley Crusher card makes it into the game. Or hopefully sooner since I don't expect to actually see a Wesley card for a long time. Maybe with a Starfleet Cadet Red Squadron ship pack? Nick Lacarno, Wesley Crusher, & Boothby the Gardener (my personal favorite Martian). [q="mado78"] I suspect Attack Wing will show up on TableTop once a Wesley Crusher card makes it into the game. Or hopefully sooner since I don't expect to actually see a Wesley card for a long time. While I've got to admit that when you re-watch TNG, Wesley isn't as bad as one remembers, a "Shut up Wesley" power would be great, maybe something about re-enabling a crew ability since everyone can now concentrate on doing their jobs? Oh, and Wil has already said one of this "Not a Vlogs" that deck building games won't show up on TableTop anytime soon. Too much thinking in each players head and not enough talking or player interaction. It would make for boring TV. That's awesome Teri. Garret is really nice. He was here in town a few years ago and he was also on hand for the TNG Cast Reunion in Calgary. He had a great story about the worst Trek episode. 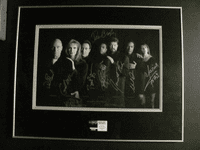 Speaking of which, all of the TNG Cast are very friendly, too, especially Marina and Patrick. Hopefully I can get my Sisko card signed by Mr. Brooks when he's here at Comic Con in November. I could be mistaken, but wasn't he promoted and then demoted again for something he did by Janeway? I seem to remember somebody did, but it might have been Tom Paris. That captain should be able to spend an action to pass him back and disable yours, like hot-potato! Janeway: Good work Mr Kim, keep it up and you'll make Ensign in no time. Kim: But I already am an Ensign, Captain. Teri: how are you liking the Krayton? I haven't had a chance to try it yet, but I like Conditional Surrender. Me, too, but I think it might be more fun if he had that ability, but instead of a cost, he simply lowered his own captain's number by two until he was used.